My Canon EF 200-400mm f/4L IS 1.4x lens has arrived. Click here to see the review. 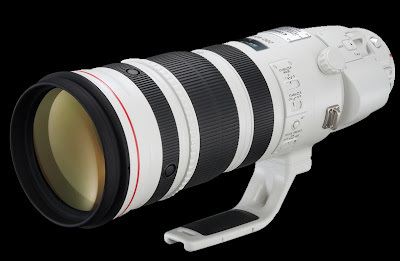 The Canon EF 200-400mm f/4L IS 1.4X Super Telephoto Lens is finally here, after over two years in development and being spotted around the world on numerous field tests, including the 2012 Olympic Games in London. This is an amazingly versatile and flexible wildlife lens and I am very excited by this announcement. You can read about the technical details and see a preview of the lens. Pre-order is available now and I have placed one for myself already. Very limited quantities will be available before the end of June. The production version of this lens will be put through a few of my upcoming, vigorous wildlife photo shoots and I will write a detailed review on it as soon as possible. London, UK, 14 May 2013 – Canon today adds a new category to its range of high-performance super-telephoto lenses, with the introduction of the EF 200-400mm f/4L IS USM Extender 1.4x to Canon’s acclaimed L-series. The EF 200-400mm f/4L IS USM Extender 1.4x features a flexible 200-400mm focal range with a fixed f/4 aperture, 4-stop optical Image Stabilizer and for the first time in a commercially available lens, a built-in 1.4x extender. These features combine to provide an outstandingly versatile lens for professional sports or wildlife photographers. A robust magnesium alloy design, environmental protection and specialised lens coatings also make it ideal for mobile use, combining with the finest quality optics to deliver exceptional results, even in the harshest conditions. The reach of the EF 200-400mm f/4L IS USM Extender 1.4x is boosted by its internal 1.4x extender, which is engaged or disengaged at the flick of a lever to provide an extended focal length of 280mm to 560mm – allowing photographers to get even closer to distant action. Ensuring the highest image performance, the optical design includes both fluorite and Ultra-low Dispersion (UD) lens elements, which help minimise chromatic aberration and eliminate colour blurring. Advanced anti-reflection SubWavelength Structure Coating (SWC) and Super Spectra Coating also reduce ghosting and flare. Thanks to the use of the latest optical technologies, image performance is unaffected when the integrated extender is used. With a constant f/4 aperture the use of high shutter speeds to capture fast-paced action or a low-light scene is possible. A newly designed optical Image Stabilizer, which provides users with a four stop advantage, while IS ‘Mode 3’ applies image stabilisation only at the time of exposure – ensuring that photographers can pan with fast-paced action without IS overcompensating for movement. This feature is ideal for sports photographers, who typically have only a split-second to capture a subject in front of them. The EF 200-400mm f/4L IS USM Extender 1.4X features Canon’s pioneering ring-type Ultrasonic Motor providing fast, silent autofocusing. For those who prefer to fine-tune focus themselves, full-time manual override allows photographers to manually focus at any moment when using AF. The Power Focus (PF) mode also increases versatility during movie shooting with the EOS-1D C or EOS-1D X, enabling photographers to achieve an accurate pull-focus effect at one of two speeds, simply by twisting the focus recall ring and stopping at a pre-set distance. Designed to answer professional demands for superior image quality and versatile zoom range, the EF 200-400mm f/4L IS USM Extender 1.4x a boasts a premium-quality design befitting Canon’s industry-renowned L-series lenses. The tough magnesium alloy chassis ensures that, despite the inclusion of the 1.4x extender, the lens is a similar weight to lenses of comparable focal length. Fluorine coatings on the front and rear lens elements also reduce the ability of dirt to cling to the lens surface, while a dust and water-resistant construction allows photographers to shoot in challenging weather conditions. The combination of outstanding optical performance, versatility, weight and tough construction will make it an essential part of any professional sports or wildlife photographer’s kitbag. Fluorite lens elements to correct chromatic aberrations, enabling high resolution and high contrast images. SWC coating reduces ghosting caused by light bouncing back from the sensor. Fluorine coating on lens surfaces to prevent dirt sticking to lens elements. Four-stop Image Stabilizer for handheld shooting at slower shutter speeds; supports the use of the built-in extender. IS Mode 3 suited to sports and action photography. Ring-type USM with high-speed CPU for silent, high-speed AF. 9-blade circular aperture for beautiful out of focus highlights (bokeh). 6.6 feet minimum focusing distance throughout zoom range. Power Focus mode to increase versatility during movie shooting. Durable and rugged lens construction, with magnesium alloy to reduce weight. Highly resistant to dust and water for use in harsh conditions. Security lock socket on tripod collar for wire-type security lock. Does Canon Warranty Covers Third Party Firmware? New Canon AF Technology Coming In July? Canon EOS-70D Camera Coming In July? New Canon PowerShot S200 Camera? Canon New Large Sensor PowerShot Camera? Canon EOS-7D Mk II Not Available in 2013?